If you are of an age when you remember Button Moon, and know what a Snickers was called before it became a Snickers, then you probably also remember how learning used to be. Sitting facing the front, watching the blackboard and copying everything down in your notebook. Learning isn’t like that anymore, and active Learning encourages deeper thought, analysis and collaboration in order to strengthen learning in your environment. There are a number of ways to encourage active learning in your classrooms. Technology is key to encourage experimentation, research and analysis. Technology should be diverse with desktops, laptops, tablets and peripherals all used to demonstrate practical theories. Collaboration is vital, with lively debates and discussions encouraged while learners share and test theories. Strategy is important, work out your aims for the learning session and the absolute best way to encourage your students to openly participate with the subject. 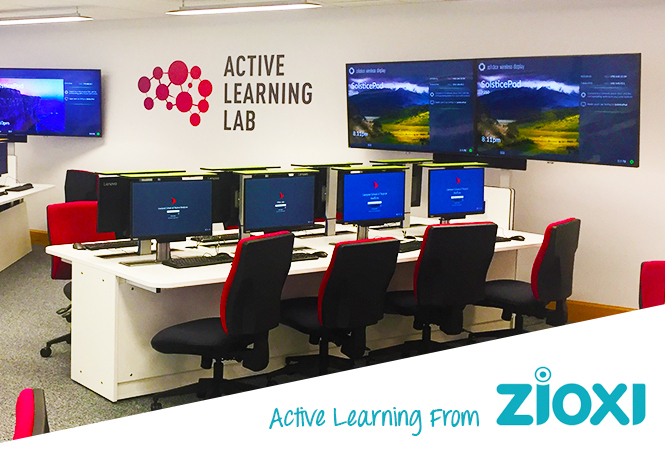 Here at zioxi we help schools, colleges and universities to build spaces that encourage active learning. With integrated desks giving flexibility and diversity of technology and collaborative desks for group working. Why not give us a call to discuss how an active learning space could work for you.